Our sales portfolio includes the following intense sweeteners. You will will learn everything worth knowing about the fundamental properties of the most important sweeteners. belongs to the dihydrooxathiazinondioxide sweetener group. It is either made of acetoacetic acid derivatives or else these occur during its production as intermediate products. Aspartame is a dipeptide made up of the amino acids L-aspartic acid and L-phenylalanine as methyl ester. It is synthesised by bonding the two amino acids with subsequent esterification. Cyclohexylamine is usually converted with the help of amido sulphonic acid. It is treated at temperatures over 100°C in high boiling solvents or in a pressure reactor. This produces cyclohexylammonium salt, which is converted with the corresponding hydroxides. This releases cyclohexylamine. the source materials for the extraction of dihydrochalcon (DC) sweeteners are flavones, which are contained in the peel of citrus fruits. The Neohesperidine found in the peel of bitter oranges is converted into Neohesperidine Chalcone through alkali treatment. Chalcone is converted into dihydrochalcone through hydrogenation. the oldest sweetener, discovered back in 1879 by Constantin Fahlberg. The first Saccharin factory was founded by Fahlberg and List in 1886. Consumption rose strongly especially during the two World Wars because of a shortage of sugar. Synthesis is carried out using either the Remsen-Fahlberg or the Maumee procedure. In the Remsen-Fahlberg procedure, toluene is converted through sulphurchlorination into the isomer compound of 2- and 4 toluenesulphonyl chloride . 2- toluenesulphonyl amide (also called OTS or OTSA) is then produced from the 2-isomer. 2-benzoic acid sulphamide is then directly obtained in an acid medium through oxidation. The corresponding salts are produced from this and purified through repeated recrystallisation (chiefly from water). This procedure is principally used in Korea. In the Maumee procedure, the source substance is phthalic anhydride. The anhydride is first of all converted into the imide. After oxidization into the isatoic anhydride, methyl anthranilite (artificial neroli oil) is formed. Through diazotization and transformation with sulphur dioxide and chlorine, 2-sulphonyl chloride of methyl anthranilite is obtained, which can be converted through ammonia into saccharinate. Saccharin is released from this, or it is converted into other salts. The sweet-tasting leaves were discovered long ago by the inhabitants of Paraguay and Brazil. Steviol glycosides are glycosides occurring in the leaves of the Stevia Rebaudiana, a plant native to Latin America. Stevioside, which makes up 7% of the content of the dried leaves, is isolated through water or a mixture of water and alcohol and then purified. Steviol glycosides are approved in the EU, in Asia and in Latin America. approved in the countries of Latin America and Asia and, since 1998, in the USA and Canada. Approved in the EU since 2004!! The most common mixture of sweeteners, which we also supply as a standard product, is the mixture of 10:1 Sodium Cyclamate – Sodium Saccharin. In other words, the mixture consists of 10 parts Sodium Cyclamate plus 1 part Sodium Saccharin 450-times, 40-80 mesh. The sweetening power, including synergism, is 100 times that of the sugar equivalent. Many combinations can be produced from several individual sweeteners. These combinations usually have synergistic effects and offer sensory advantages. Further information on sweeteners you can also find on the website of the Suessstoff-Verband. 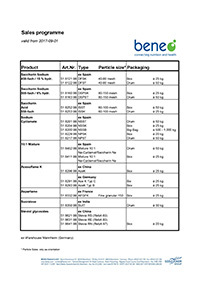 Here you can find details on particle sizes and packaging information..